With this setting, the edit page is converted into an input form that you can use to create and edit additional information, such as the title, the last edit date etc., in Microsoft Office. Information about entering the title can be found here. Enter a label as the title that describes what type of documents are being accessed. With this title you can view and open documents in Office later. With this setting, Office documents will be transformed by Intrexx so that the Office Integration can allocate the document accordingly. In some circumstances, the setting can therefore not be activated elsewhere because only one file field can be configured this way. Click here to see what the input forms with the drop-down lists look like in Microsoft Office. Drop-down list for "Open from Intrexx"
Here you can see all the fields that are displayed for the tabular list of documents from the Intrexx portal that can be opened in Microsoft Office. Drop-down list for "Save as in Intrexx"
This list will be shown when you want to save a document in Office using the file menu item "Save as in Intrexx". In each case, opens a dialog where the fields can be selected. You can recognize an edit page with active Office integration in the application structure by the red marker. Some edit and view elements cannot be included in Office integration. These elements will be automatically deactivated in the Elements area and cannot be added to the edit page any more. Buttons can be created (such as to use the edit page in the portal), but will not be displayed when the input mask is loaded in MS Office. The defined actions are, therefore, not available in Office. If the edit page is accessed in the portal via the browser, the button will be available as usual and will execute all configured actions. Scripts, which have been defined on the edit page or by an element on the page, will likewise not be executed when the page is loaded in MS Office. Groupings can be created, but will be ignored in Office. The permissions required for Office integration can be controlled from the properties dialog of the application. 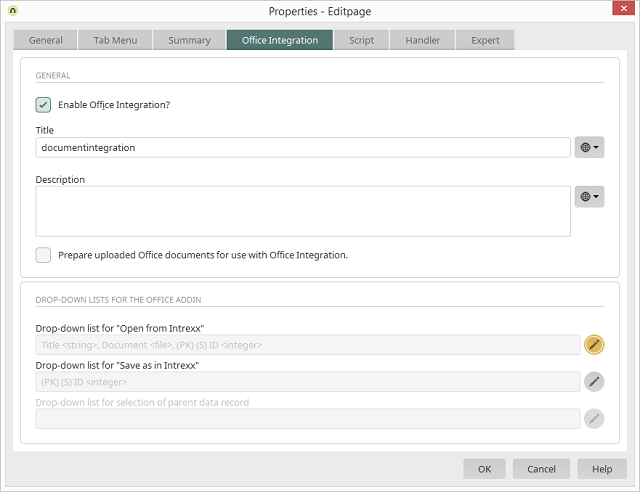 The users of Office integration must at least have the data group permissions "Read", "Add", and "Change" for the data group that contains the edit page. These permissions are required to edit the documents. Permission for the edit page, which you can find on the Pages tab, is also required. Managing documents in the portal can be structured hierarchically with subordinate data groups. If you want to, for example, administrate documents for business partners and documents that apply to the customers of each partner, you will create a main data group called "Partners" and a subordinate data group called "Customers". In the properties dialog of the edit page in the subordinate data group, the "Drop-down list for selection of parent data record" can now be edited. To do so, proceed exactly as before when setting up the lists "Open from Intrexx" and "Save as in Intrexx", with the only difference being that all fields from the superior data groups will be selected for the columns in the list in MS Office. The automatic assignment of the subordinate data set to the parent data set in the MS Office dialogs will be taken care of for you by Intrexx when you save a subordinate document in Intrexx.